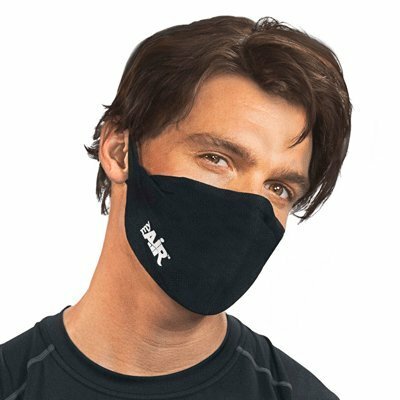 Reusable two-way mask with replaceable filters. Each mask kit contains a lightweight sheath, carrying case, and 3 replaceable filters. MyAir masks are reusable, washable and latex free. One size fits most adults. Personal Air Space...with a twist! Helps keep you hydrated while blocking out 99.997% of viruses, bacteria, allergens and contaminants. Hydration Plus Protection - Advanced filtration technology to reduce moisture loss (a leading cause of jet lag) and reduce exposure to viruses, bacteria, allergens & contaminants. Filter membranes block 99.997% of airborne pathogens (bacteria & viruses that cause illness), block allergens, pollen & airborne contaminants down to 0.1 microns, and reduce moisture loss by 88%. Data from independent microbiology & permeation test lab results for MyAir filters. Ultra thin, ultra breathable and ultra comfortable. Conforms to different face shapes & sizes, attaches with soft, stretchy ear loops. Unique fit and style, with 9 fashion forward fabrics to choose from. Comfortable, 4-way stretch sheath is made from fabric designed for sports applications - feather light and highly breathable. Reusable two-way mask with replaceable filters. Each mask kit contains a lightweight sheath, zip lock carrying case, and 3 replaceable filters. MyAir masks are reusable, washable and latex free. One size fits most adults. If you have any questions about this product by MyAir, contact us by completing and submitting the form below. If you are looking for a specif part number, please include it with your message.